VANCOUVER, BC, January 28, 2019 — Mirasol Resources Ltd. (TSX-V: MRZ, OTCPK: MRZLF) (the “Company” or “Mirasol”) is pleased to report the signing of binding letter agreement (the “Agreement”) with Newcrest International Pty Limited, a wholly owned subsidiary of Newcrest Mining Limited (ASX:NCM)(“NCM”), for an Option to Farm-in on the Gorbea High-Sulfidation Epithermal (HSE) gold projects (the “Project”) in Chile (Figure 1). Mirasol’s CEO Stephen Nano stated: “Newcrest is the ideal partner for our Gorbea projects. 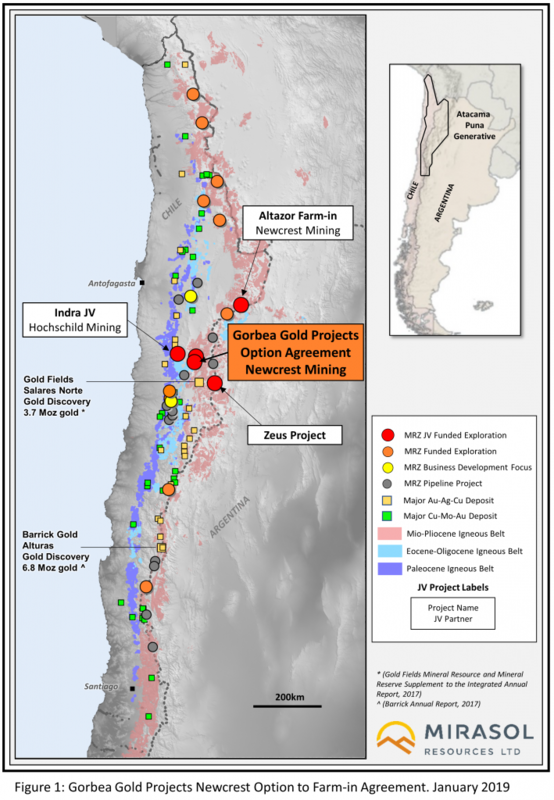 Subject to drill permitting, Newcrest will this year fund drill testing of two, large Mio-Pliocene belt HSE Au+Ag projects at Gorbea and under a separate agreement, at the Altazor project in northern Chile”. Stage 4: After completion of Stage 3, Mirasol can elect to: (i) contribute its proportionate 25% share of further development expenditures, (ii) exercise a one-time equity conversion option to convert up to 10% of its equity into a NSR royalty at a rate of 2.5% equity per 0.5% NSR royalty (max 2% NSR royalty) and then contribute funding to advance the Company’s remaining Project equity interest; or (iii) dilute. The rate of royalty dilution (up to 2% and triggered upon dilution of its interest to 10%) will be adjusted based on the percentage royalty acquired as part of the equity conversion option. NCM will hold a 0.5% NSR buyback right at fair market value exercisable on the conversion royalty or the dilution royalty. The Gorbea Project comprises a package of nine projects totaling 26,684 ha, including the Atlas Au+Ag and the Titan Au (Cu) projects, located in the Mio-Pliocene age mineral belt of northern Chile. Mirasol has completed and reported (news release January 7, 2018) the results of an integrated analysis of the extensive Atlas database generated from exploration expenditures in excess of US$ 8 million completed under a prior joint venture agreement. The previous exploration identified a significant body of HSE gold mineralization at the Atlas project, which returned a drill intercept of 114 m grading 1.07 g/t Au, including 36 m grading 2.49 g/t Au (news release September 11, 2017). However, the scale of the Atlas Au+Ag system, combined with the relatively modest amount of exploration drilling to date (10,499 m in 26 holes) and the range of priority targets identified, highlights the Project as a large, under-explored HSE system, requiring further drill testing for potential large tonnage bulk minable Au+Ag mineralization. Under the terms of the pervious Gorbea Joint Venture (terminated in April 2018), all exploration was managed by the then joint venture partner. Pre-joint venture exploration on the projects was managed by Stephen C. Nano, who is the Qualified Person under NI 43-101. Exploration data generated from the previous Gorbea Joint Venture program was reviewed and validated by Mirasol prior to release. The technical interpretations presented here are those of Mirasol Resources Ltd.